A Cool Residence Option for EC Montreal Students! Deciding to go study English abroad or to study French abroad requires a lot of decision making. One of those decisions is “where do I live while I’m away from home”? Students coming to Montreal to learn French or English have one less thing to worry about. Not only does EC Montreal have an amazing homestay programme they also have the best student residence in the city, La Marq. 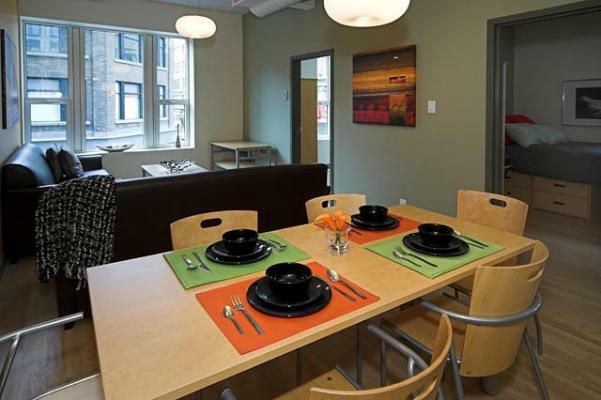 EC Montreal’s student residence is located in the heart of Downtown Montreal, surrounded by trendy restaurants, clubs, shops, cafés and only 10 minutes walking distance to the school. The residence offers free wireless internet, each apartment has central air-conditioning, kitchenette, living room, television, DVD player and bathroom. Students have the privacy of their own bedroom while sharing common areas with other EC students. Bed linens and towels are also included, one less thing to worry about. Another advantage for choosing residence living is that although the apartment only houses EC Montreal international students from all around the world, the building itself has university students from McGill and Concordia University. This is an excellent opportunity for students to practice their language of study and make friends with others in the similar age group. The residence offers weekly activities for all students. This month is Halloween; the residence has weekly horror movies playing in their movie lounge, a Halloween costume contest and pumpkin carving!!! How exciting is that? They also have weekly pizza night. While you’re there don’t forget to take advantage of their games room or fitness centre. EC Montreal will also be hosting a games night at the residence on Thursday, December 13. They have pool tables, table hockey, video games and a variety of board games to play. EC will serve festive refreshments. If you are in Montreal and interested in residence living, please come to the office to speak to our Accommodation Coordinator, Mirka, about staying at La Marq!